The Midwest was hit with snow on Sunday and rain is now headed to the Northeast. Over 1,400 flights were canceled on this post-Thanksgiving Monday as a dangerous snowstorm tore through the Midwest before heading to the Northeast as rain. Airlines were forced to cancel over 1,200 flights on Sunday as snow blanketed parts of the Midwest on the busiest travel weekend of the year. Airlines are now overloaded as the cancellations bleed into Monday -- and heavy rain is hitting Northeast airports, making matters worse. There have been 1,468 Monday flight cancellations so far, with Chicago's O'Hare International Airport feeling the brunt of the impact with 1,189 of the day's cancellations. 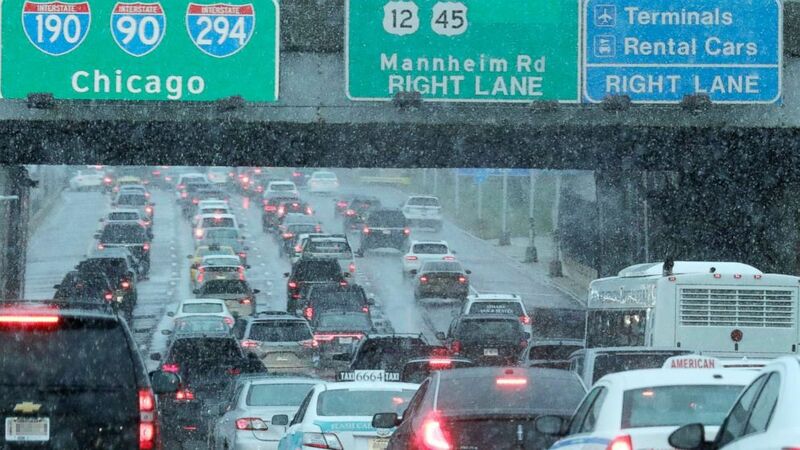 (Nam Y. Huh/AP) Heavy traffic is seen on Interstate 190 near O'Hare International Airport in Chicago, Nov. 25, 2018. "What are you gonna do? It's the weather," traveler David Erickson told ABC News as he waited at O'Hare Sunday. "You just gotta deal with what they give you and they can't really control the weather." Erickson said the most "frustrating" part is to "wait in line and there's no clear answer as to what's next, because the next flight's cancelled, as well." "The better option, I guess, would have been to drive, but having to drive in the snow is probably not much fun either," he said. "I guess we just wait it out and see what we get." 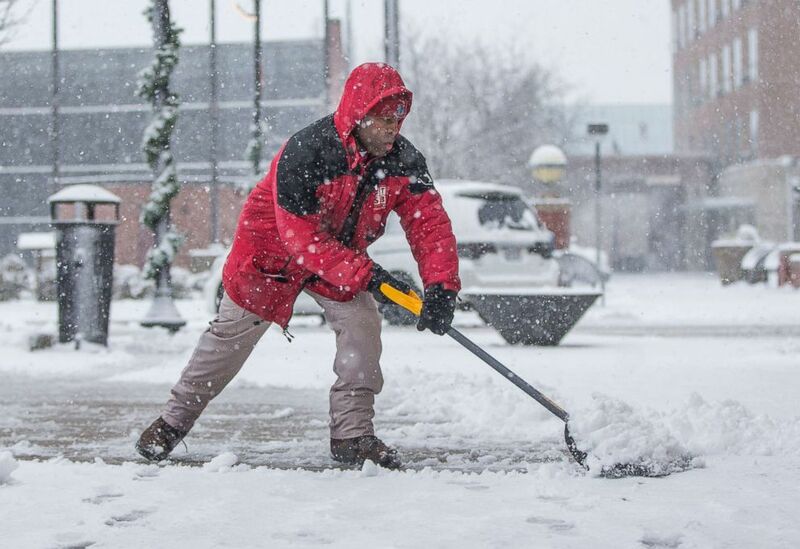 (Robert Franklin/South Bend Tribune via AP) Terrance Pates, of Downtown South Bend, clears a sidewalk along Michigan Avenue on Nov. 26, 2018, in South Bend, Ind. Mick Butterfield, who was trying to fly from Milwaukee to Austin, also found himself stuck in Chicago on Sunday. "The frustrating thing is really because you cannot actually do anything about it," he told ABC News. "You're completely helpless." 5 cancelled flights in 24 hours, Midwest winters #chiberia ??#phillybound?? The Transportation Security Administration said it set a new single-day record on Sunday, screening over 2.7 million travelers. The winter storm brought blizzard-like conditions to parts of the Midwest and the Great Lakes and shut down major highways in states like Kansas, where the governor declared a state of disaster emergency on Sunday. The declaration came as a large chunk of Interstate 70 shut down due to poor visibility and road conditions. The weather also shut down parts I-80 in Nebraska as the fast-moving storm created whiteout conditions that made it nearly impossible for drivers to see. Iowa got the most snowfall among Midwestern states with totals of up to 17 inches, while Rockford, Illinois, got almost a foot, making history as the biggest November snowstorm for that area. 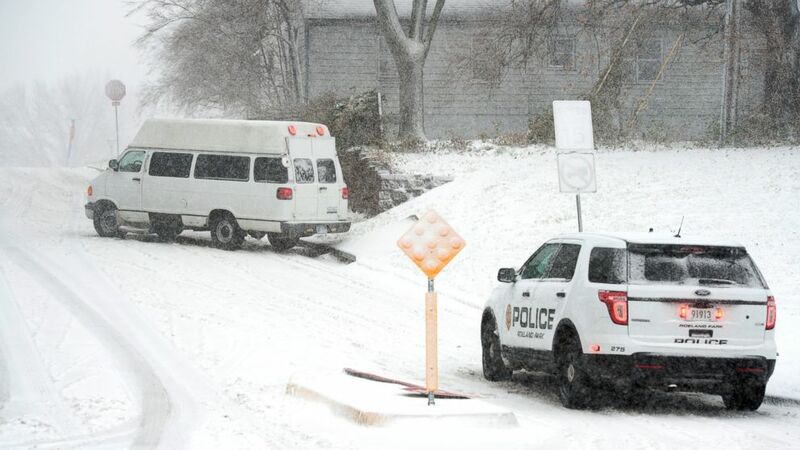 Kansas City, Missouri, saw 5.8 inches of snow, marking the city's snowiest November day since 1923. 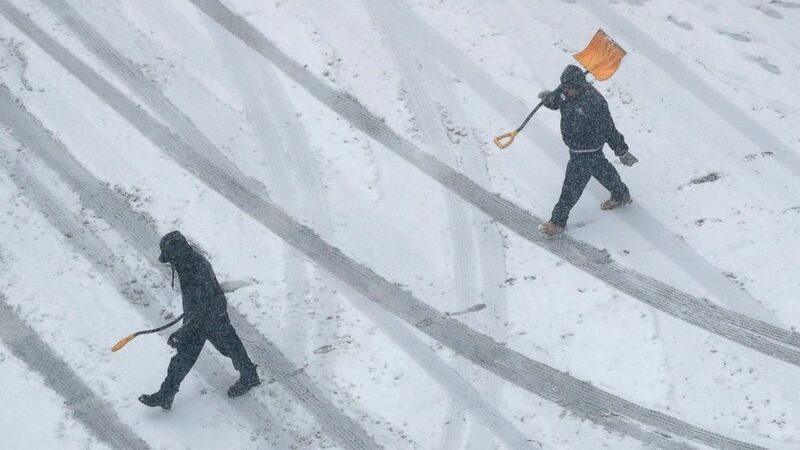 (Charlie Riedel/AP) Workers carry snow shovels as snow falls, Nov. 25, 2018, in downtown Kansas City, Mo. The storm has left the Midwest and is now moving into the Northeast as heavy rain. The storm is threatening to bring flash flooding from Philadelphia to New York City and up to Boston, just in time for the evening commute. LaGuardia Airport in New York City and Newark Liberty International Airport in New Jersey were already seeing flight cancellations and delays Monday afternoon. Around 7 p.m., as heavy rain hits New York City and southern New England, snow will be falling in northern New England. Along the coast, from Long Island to Boston, wind gusts may exceed 50 mph. ABC News' Jeff Cook, Alex Perez, Andy Fies and Christine Theodorou contributed to this report.